Japanese electronic components manufacturer Alps Electric Co., Ltd. (TOKYO: 6770; President: Toshihiro Kuriyama; Head Office: Tokyo) will exhibit at Convergence India 2018 to introduce its technologies, with particular focus on the Internet of Things (IoT) and automotive electronics markets. Convergence India 2018 opens at Pragati Maidan in New Delhi, India, on March 7, 2018. At Convergence India 2018, South Asia’s largest ICT exposition, Alps Electric will exhibit products for the IoT and automotive markets. Sensor network modules for collecting a variety of data, essential for IoT business creation. Integrating low-power, high-precision and compact sensors with a Bluetooth® communication module, these products are capable of acquiring pressure, temperature, humidity, ambient light and other environmental data, as well as six-axis (geomagnetism + acceleration) sensing. A special app (for Android) is available for viewing data and changing settings on a smartphone or tablet. In addition, radio certification has already been acquired for various regions around the world, allowing smooth, low-cost progression to demonstration testing. At Convergence India 2018, we will present actual application examples in areas including abnormality detection in factory facilities and sports technology. Alps Electric’s V2X Communication Modules, the industry’s first to be mass-produced, support both single and dual antenna (transmit/receive diversity). They are also available as a package with an ETSI or WAVE protocol stack plus a security chip. Other modules for vehicle-to-vehicle (V2V) or vehicle-to-infrastructure (V2I) communication, for enabling connected vehicles, will also be introduced. They include GNSS and LTE Modules. If you are at Convergence India 2018, please stop by the Alps Electric booth. 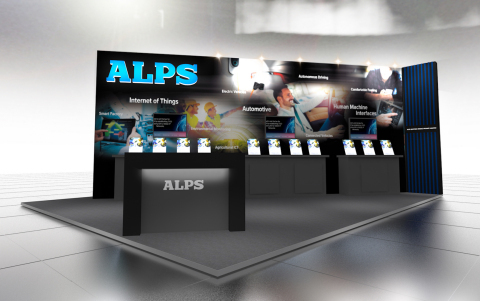 Alps Electric possesses core technologies in three areas—human-machine interfaces, sensors and connectivity—and persistently creates electronic components of value for the customer through enrichment and fusion of those technologies. The company has performed tremendously well in these areas. In the human-machine interface and sensor domains, Alps Electric has been selected as primary supplier of products for applications including smartphones, game consoles and automobiles. And in the connectivity domain, the company led the industry in commencing mass production of V2X modules for vehicle-to-vehicle and vehicle-to-infrastructure communication.